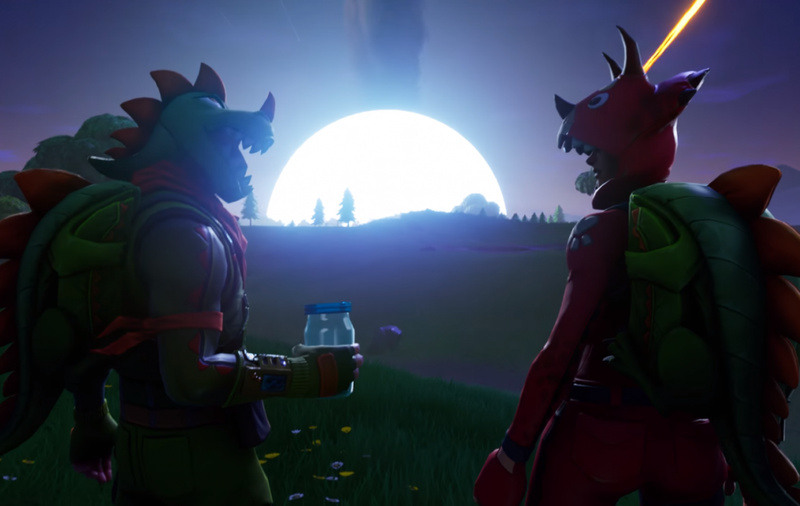 Season 4 has brought big changes to Fortnite, including the destruction of Dusty Depot and the appearance of hidden superhero and supervillain lairs, but one addition was almost overlooked – a giant dinosaur footprint, which has reignited fan theories about the meteor now sitting in the new Dusty Divot. See what else is happening in the patch notes for the Fortnite Season 4 update! The footprint was spotted and snapped by Qpaniic on Reddit and is located within a group of houses between Snobby Shores and Greasy Grove, just south of the mountain. There’s also a camera pointed at the destruction. Fortnite fans have been speculating that Season 4 would be related to the extinction of the dinosaurs before the meteor even hit, and this new evidence seems to add fire to those theories. Eagle-eyed viewers of the Season 4 trailer spotted a conspicuous fossil logo at the start, and the video itself ends with two characters in dinosaur costumes. The battle pass includes the same fossil picture that appears in the video, which Reddit user WNickW suggests is a clue to what’s going to happen over the course of Season 4. Before the meteor destroyed Dusty Depot it seemed like it was going to hit Tilted Towers, but OtterEats theorises that it might not be safe yet and might instead be taken out by the same Godzilla-like creature that left the footprint. PortiloMEME instead makes the risky statement, “if that meteor at Dusty isn’t a dinosaur egg, I’ll get a Brite Bomber tattoo”. Hopefully he’ll be proven right and won’t be forced to go through with that.